This Homemade Nutella Croissants Recipe is just what you would taste at a French Bakery in the heart of Paris. Layers of flaky buttery croissant dough filled with your favorite chocolate hazelnut spread. If you love plain croissants or almond croissants, be sure to check out my other croissant recipe. This recipe was originally posted February 19, 2018, we’ve tweaked it a bit since then. This post may contain affiliate links. Read my disclosure policy here. Making homemade Nutella croissants is not difficult; you don’t need any expensive ingredients or equipment. All you need is time and technique. They do take quite some time and patience, but the end result is so worth it! You just can’t compare homemade croissants to store bought ones. Follow these step-by-step photo instructions and you will master the art of croissant making! Tip: If this recipe makes too large a portion for your needs, follow the tips at the bottom of the printable recipe for storing the dough in the freezer for future use. 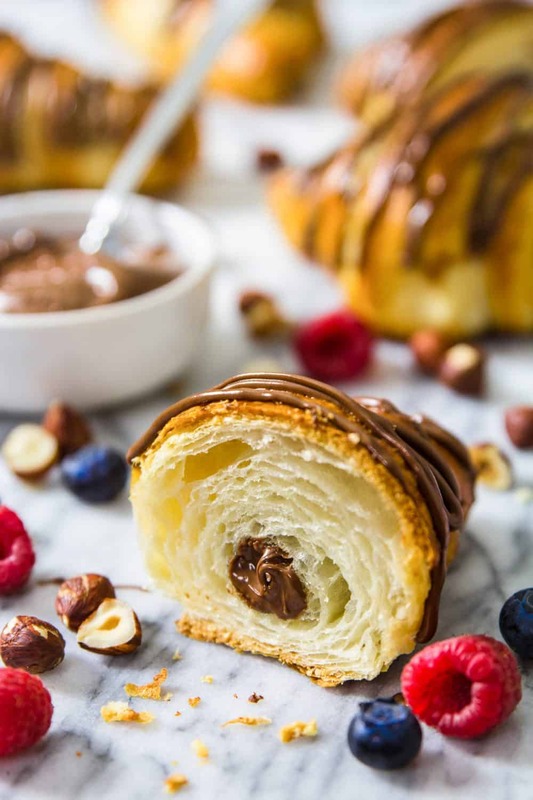 Using your stand mixer, follow the instructions in the printable recipe for preparing the homemade Nutella croissants dough. 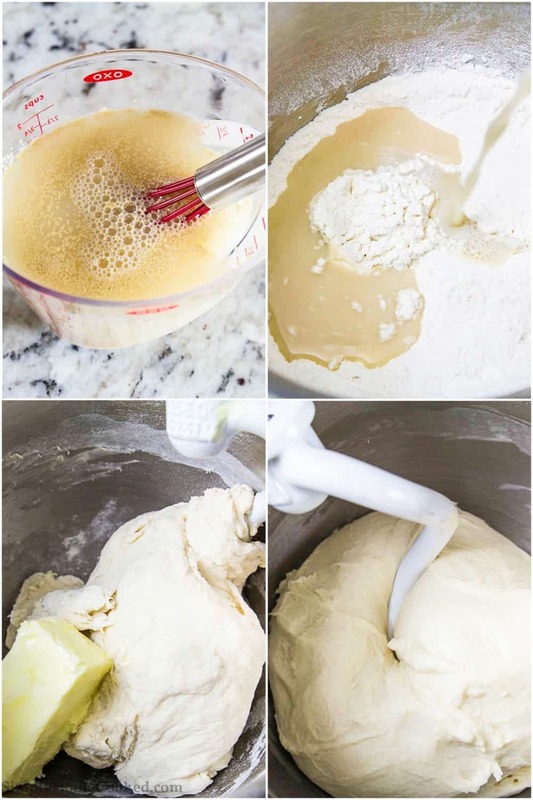 A stand mixer makes this process much easier to manage and helps you to save some time in a somewhat lengthy pastry making process. While your dough is being prepared, you can work the butter between parchment paper to make the folding process that is next easier to manage. I share tips on creating a template to make the process easy below. I find that using a rolling pin for this step is super helpful. Allow your dough to rise, and proof as directed. 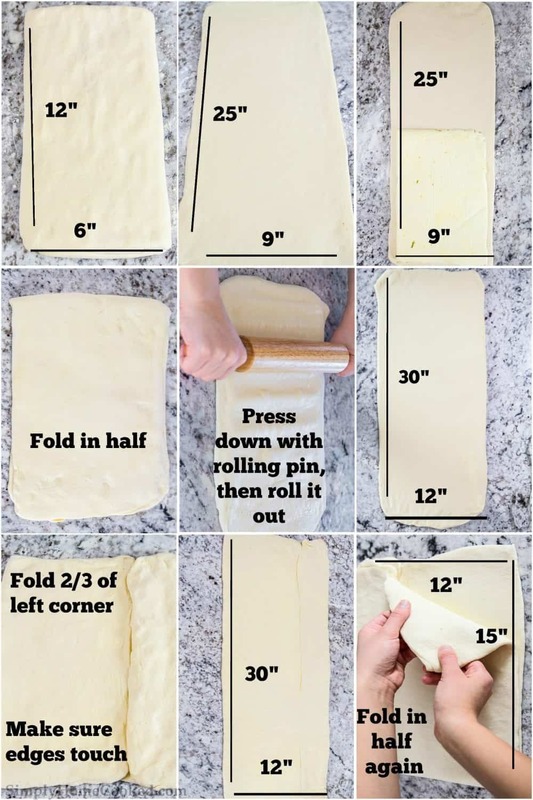 You will roll this dough out and measure to create precise dough measurements. As directed, you will deflate the dough after it rises. Next, comes a lengthy process of folding and refolding to create those light buttery flaky layers expected. Roll it out to 30 x 12 again then fold it into thirds. 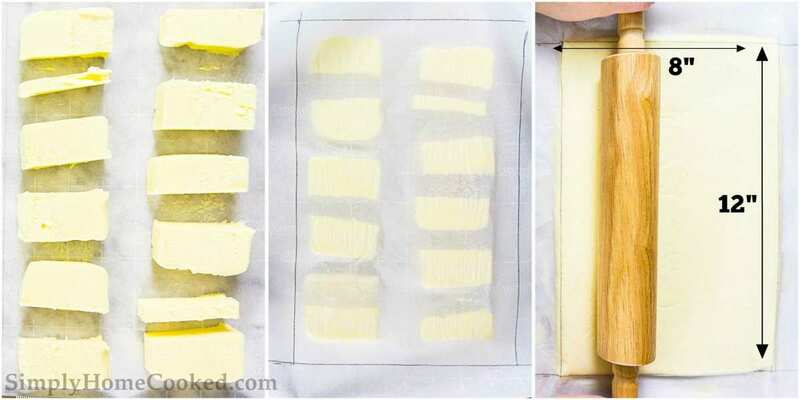 If the butter begins to melt, cover with plastic wrap and refrigerate for 30 minutes. The size of the dough should be 12 x 8 inches before wrapping it in plastic wrap. 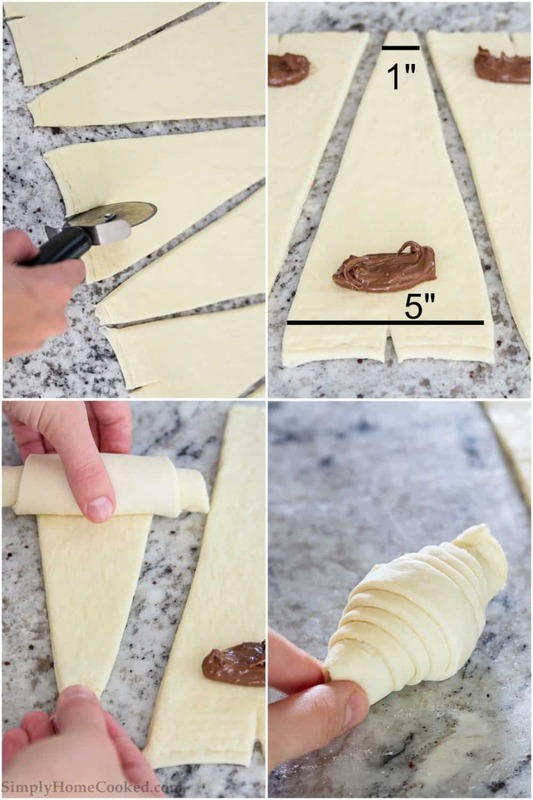 After chilling the dough, you will follow the step by step process below to cut into triangles using a pastry wheel for rolling. After your homemade Nutella croissants are rolled, you will allow them to rise again before baking to a beautiful golden brown. While this homemade Nutella croissants recipe is one of my favorites, I also have tons of other great recipes featuring this famous hazelnut spread. Check them out for delightful breakfast, pastry, and dessert treats for your family! Extra: For another amazing croissant, check out our Almond Croissants Recipe! Starting from the shorter edge fold the dough into thirds. 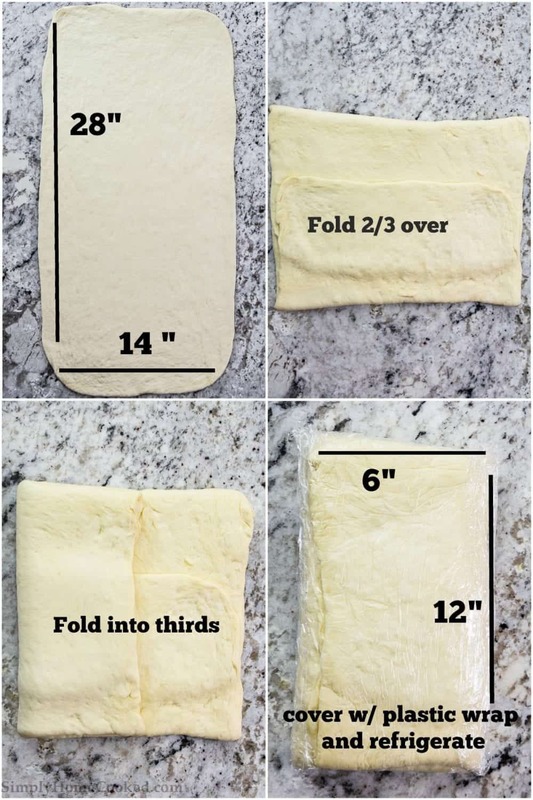 At this point the dimensions of the folded dough should be about 6 x 12 inches. Cover with plastic wrap and refrigerate for 6-8 hours (or overnight). I like to make small slit in the middle of the wider ends so the croissant folds nicer, but thats totally optional. Fill the wider end of the triangles with 1 heaping tablespoon of the nutella. Then roll the triangles toward the narrow end as you slightly pull the pointed end away. Pinch the ends of each croissant to keep the nutella from oozing out. Place the croissants onto a baking sheet lined with parchment paper and let them rise in room temperature for 1-2 hours or until they double in size. Do not put them in a warm place to speed up the rising process. You don't want the butter to melt. 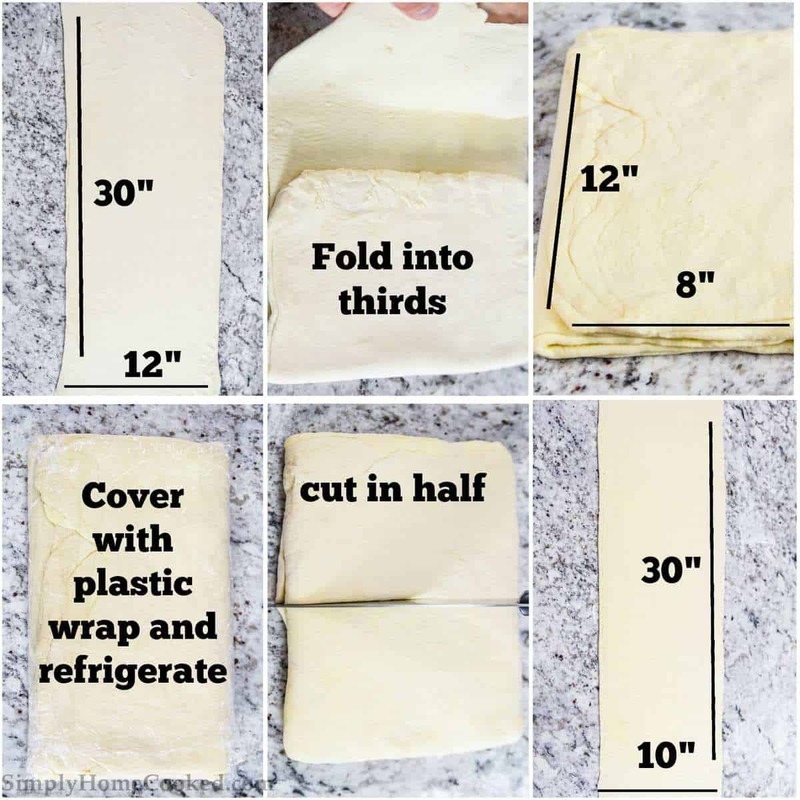 Meanwhile, remove the second half of the dough from the refrigerator and roll it out to a 30x10 inch rectangle and repeat steps 14-16. Brush each croissant with egg wash and bake at 390 degrees Fahrenheit for 10 minutes, then 370 degrees Fahrenheit for 15 minutes. Baking time may vary depending on your oven. Once the croissants are cooled, drizzle extra nutella over them. If this portion is too large and you won't be able eat all the croissants within a few days, make half of the recipe up till before the last proofing cycle (step 15) and freeze them on a baking sheet. Once they are frozen solid, place them in ziplock bags to prevent them from obtaining any freezer taste. That way you have croissants ready to bake at all times. If you go through with freezing croissants, give them at least 6 hours to proof at room temperature before putting them in the oven. Oven temperature should remain the same as baking them unfrozen. Also, don't forget the the egg wash.
Hi I would like to ask you what flour did you use and also how many grams of butter is that , since I don’t know cups measurement 🙁 thank you!! 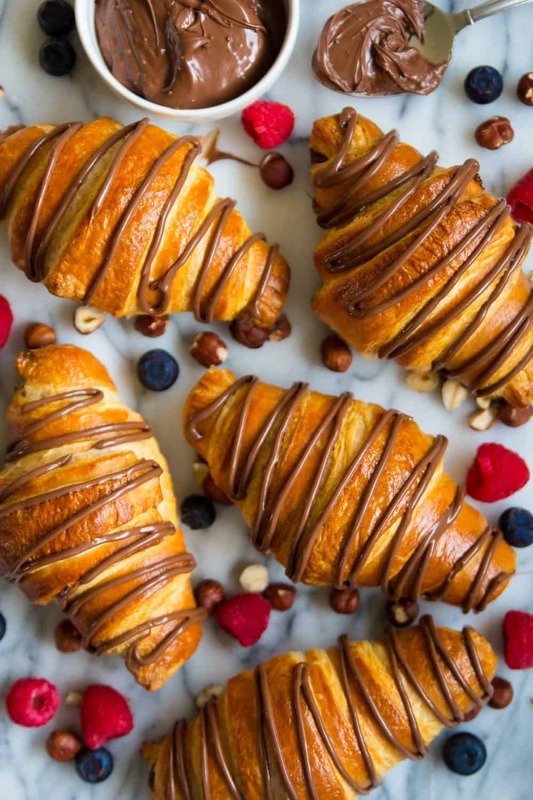 Both the nutella and almonds on your website look amazing, would the baking process be the same if I left out the filing to make plain croissants? Can’y wait to make these! Thank you Sophie! The baking process will differ just a little if the croissants are plain. You’ll just need to skip the last baking step with the almond paste on top of the croissants. I hope you enjoy them!